Chef Eric Adjepong and his girlfriend, decorator Janell Mack of DÃ©cor Moxie, combined their passions for food and design to create Pinch and Plate, a mobile dinner party service that removes the hassle of planning, decorating, and cooking for a dinner party. Chef Adjepong, a first-generation Ghanaian-American, provides guests a plated multiple course or tasting menu, such as Jollof Rice Paella, a West African rice staple cooked with tiger prawn scallops, marinated short rib with broccoli miso purÃ©e or curried corn bisque. Mack handles those little nuances that help set every dinner party apart, such as the ambiance–table setting, floral design, lighting and more. “We realized we had something special on our hands the day Janell asked me to create some dishes for a five-course brunch dinner party she wanted to host for some of her friends. Usually when I’m prepping I’m locked into whatever it is I’m doing in the kitchen, but I caught a glimpse of the finished table. When I looked at Janell the idea of actually making this into a thing came to mind. It took all of about 15 minutes before Janell, on the other end of the apartment, called my name and said ‘Babe! I think I have an idea.’ I already knew what and where she was going and, before she had a chance to talk, told her ‘Yup, I’m already there,’ saysÂ Adjepong. 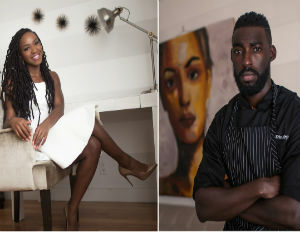 BlackEnterprise.com caught up with the power couple to learn how they split responsibilities, and to get some tips for hosting a dinner party. BlackEnterprise.com: What unique problem does your business solve for your guests? Mack: We created Pinch & Plate to make the idea of hiring a personal chef and decorator more approachable for the average person, in addition to providing a convenient alternative to doing a group dinner at a restaurant. Our target audience can range from the young professional to the retiree. What makes our business concept unique, is that we allow the host to actually enjoy their dinner party and guests. Not only are you hiring a private chef to prepare amazing food, you’re also hiring a decorator to set the table, who serves you and your guests. We also clean up afterwards. Where do you find inspiration? What types of experiences can guests expect from your dinner parties? Adjepong:Â I’m actually a first-generation Ghanaian-American, so having the experience from two completely separate cultures pretty much shaped my upbringing. I try to have as much fun as possible when creating a menu. Seasonality and pairing familiar flavors in unfamiliar ways, is what I enjoy. Guests can choose from a list of dishes I have created, or customize a menu based on preferences, special occasions, dietary restrictions, allergies, etc. All that a fine dining restaurant provides without the formal, sometimes stuffy atmosphere. Contemporary dishes with quality, seasonal ingredients paired with wine and cocktails. Dinner with a hand-selected group of guests looking to experience a different way to eat. When it comes to managing the day-to-day business, how do you split responsibilities? Mack: I am responsible for responding to all business inquiries that come from the website, maintaining our Instagram and Twitter accounts, and managing the overall feel of all dinner parties. Adjepong: I am responsible for all cooking and food preparation, menu planning, and pricing. We both are responsible for marketing and clean-up at the end of each dinner party. Can you provide our readers with tips for hosting dinner parties at home? Adjepong: –Plan a simple menu. Unless you have an outside caterer or extra hands preparing the meal, go simple family style. It’ll allow you to finish early and enjoy your guests. Mack: – Buy extra. When having a dinner party, things happen – dishes or glasses can break, or guests may drink or eat a little more than expected. As the host, you want your guests to enjoy themselves as much as possible, so be sure to have extra place settings and more than enough food and drinks. Do it your own way. Yes, there are ‘rules’ to setting the perfect table, sending invitations, and choosing the appropriate aperitif, but as long as your guests are vibing and enjoying themselves…that’s all that matters. Think about who you’re inviting. You want to make sure personalities mix well together and guests are comfortable socializing. VisitÂ www.PinchandPlate.com.Â FollowÂ @PinchandPlate on Instagram. PINCH AND PLATE from The Distinguished Urban Society on Vimeo.